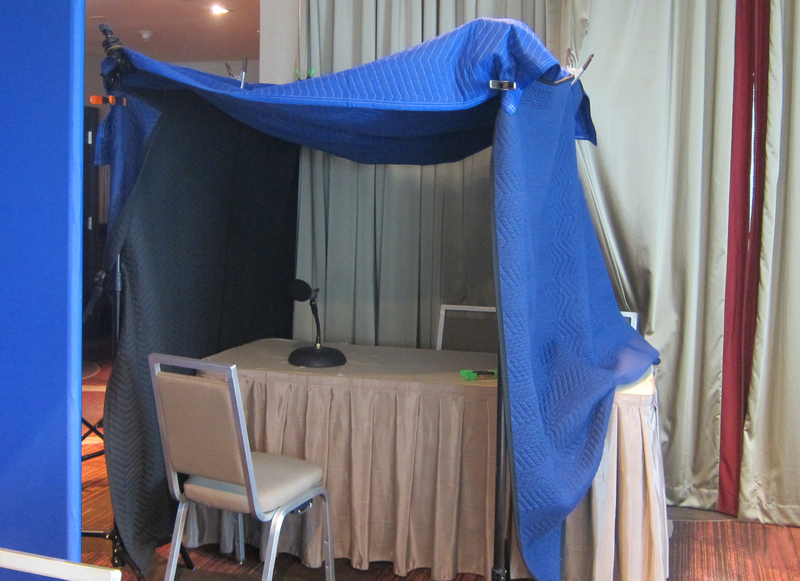 The improvised sound booth used to record the narration. Putting together a brand new 12,000 square foot museum exhibit has been quite an adventure. There are countless components that go into the design and fabrication of an exhibit. Currently, we are working with a design company, an interactive contractor, a fabrication company and an audiovisual production company. One of the highlights of the experience came on May 6th when museum curator Herman Eberhardt and I traveled to New York City to meet our audiovisual contractor, Monadnock Media, to record the narration for our Legacy film. There are 17 audiovisual productions in our new exhibit ranging from silent film treatments to immersive theater experiences. But there is no more important film than the one which will be shown in the Legacy Theater, the very last thing people experience in our exhibit. Here our visitors should understand that the world we live in today is still very much the world that Franklin Roosevelt envisioned and fought for. Our team struggled with the script for this important theater. Nothing seemed to hit the mark until our audiovisual producer found an essay that President Bill Clinton had written about FDR back in 2000. As soon as we read it we knew it was our script. Clinton captured the essence of FDR and his legacy. 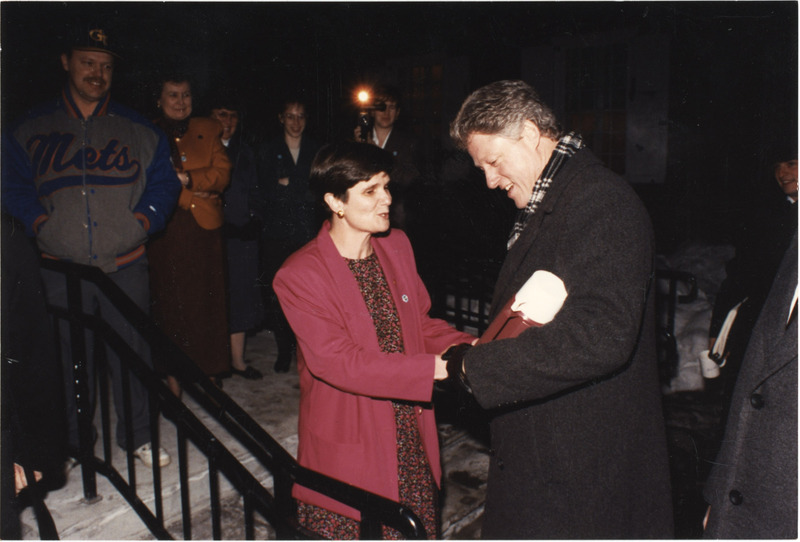 President Clinton and now Library Director Lynn Bassanese. February 1993. I reached out to President Clinton through his staff and my dear colleague, Terri Garner, director of the Clinton Presidential Library. I was not only asking to use Clinton’s essay but I wanted him to read it as the narration for our film. A lot to ask one of the busiest former presidents in our country’s history. I knew the one thing I had in my favor was that Clinton loved FDR. He had visited the Roosevelt Library three times during his presidency and once after leaving office. Fortunately for us he agreed to record – our last hurdle was working with his staff to find the time in his busy schedule. We did the recording at a New York City hotel after he attended a meeting of the Clinton Global Initiative. He seemed a bit tired after a very long day but he was charming and gracious and the minute I heard him reading his words I knew we were going to have an amazing experience for our museum visitors. Our heartfelt thanks to President Clinton for his amazing generosity with his time and his words and to Terri Garner, director of the Clinton Presidential Library and Museum, and Elizabeth Bibi, senior communications associate for the Clinton Foundation, for their assistance in making it all happen.